1.5 You will be required to confirm that you accept these terms and conditions when you order any Products from our site. Please click on the button marked "I Accept" at the end of these terms and conditions if you accept them. Please understand that if you refuse to accept these terms and conditions, you will not be able to order any Products from our site. 1.6 You have indicated that you are a Personal Customer. These terms are not designed to apply to business customers, if you are a business customer please go back and check the appropriate box as different terms will apply to you. 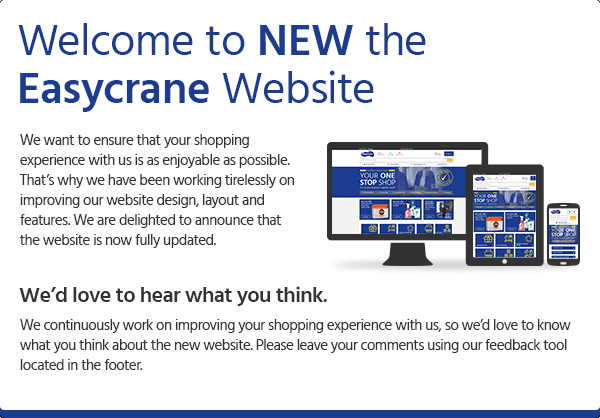 2.1 www.easycrane.co.uk is a site operated by Easycrane Ltd, Unit 23, The IO Centre, Armstrong House, Royal Arsenal, London, SE18 6RS.– Company No. 04612434(“we”) with certain services provided by Office Power Limited who are registered in England and Wales under company number 08068760 and with a registered office at Dome House, 48 Artillery Lane, London, E1 7LS. Office Power's main trading address is the same as their registered office address. When you order products through www.easycrane.co.uk you may be invoiced for those products by Office Power and asked to make payment to Office Power. It will be clear from the invoice that the order relates to www.easycrane.co.uk. 5.1 Before an order is placed you will be given an opportunity to verify and correct the products included in your order. After placing an order via the Website, you will receive an e-mail from us acknowledging that we have received your order. This acknowledgement is for your convenience only and this does not mean that your order has been accepted. Your order constitutes an offer to us to buy a Product. All orders are subject to acceptance by us, and we will confirm such acceptance to you by sending you an e-mail confirmation of our acceptance of your order (the “Order Acceptance”) . The contract between us or between you and Office Power (see 2.1 above) (“Contract”) will only be formed when we send you the Order Acceptance, whether or not you receive such email. 6.4 When Products are in stock, if you place an order before 5.00pm on a working day we will aim to deliver your order on the following working day. Furniture and safes are usually subject to different delivery periods and we aim to deliver our vouchers within 7 working days of you placing your order. 6.7 We will always need a signature of delivery of all Products. 6.10 Please note that if you have ordered a safe or furniture or other large of heavy items that our couriers are only insured to deliver to the ground floor of buildings. If you are ordering this types of Product we will ask you questions regarding access, however, it is your responsibility to ensure that there is sufficient access (for example door widths) to enable delivery of the Product. The Products will be at your risk from the time of delivery. Ownership will pass to you when we receive payment in full for the Products ordered. 8.7 The “RRP’s” used on the site represent the manufacturer’s suggested selling price and is not indicative of the prevailing selling prices at any given time or in any given area. 9.2.3 any Products which comprise of audio or visual recordings such as CDs, DVDs or computer software if you have broken the seal on such item. 9.3 If the terms of condition 9.1 apply then we will contact you with a returns number and we will arrange for collection at our cost. Once the Products are back at our warehouse and we have had an opportunity to inspect them to check that they are in resalable conditions then we process the refund in respect of the price of the Product, including any delivery charges as soon as possible and in any case within 14 days of us receiving the Product in our warehouse. You have a legal obligation to take reasonable care of the Products while they are in your possession. If you fail to comply with this obligation, we may have a right of action against you for compensation. 9.4 If you contact us outside of the 14 day period and the Products are not defective then we may at our discretion accept a return of the Products, however you may not receive a full credit in respect of the price you paid for the Products and your refund may be by way of a credit note. 9.5 If you consider there to be a shortage in your order please contact us within 14 days of receipt of your order so that we can rectify your order appropriately. 9.6 If you consider a Product to be defective or damaged please contact us as soon as possible after receipt of your Products. We will then contact you with a returns number and we will arrange for collection at our cost. Once the Products are back at our warehouse and we have had an opportunity to inspect them we will notify you of your refund via e-mail within a reasonable period of time. We will usually process the refund due to you as soon as possible and, in any case, within 30 days of the day we confirmed to you via e-mail that you were entitled to a refund for the defective Product. Products returned by you because of a defect will be refunded in full, including a refund of the delivery charges for sending the item to you. 9.7 We will usually refund any money received from you using the same method originally used by you to pay for your purchase. 10.4 We are not responsible for indirect losses which happen as a side effect of the main loss or damage and which are not foreseeable by you and us, including but not limited to loss of anticipated savings provided that this condition 10.4 shall not prevent claims for loss of or damage to your tangible property that fall within the terms of condition 10.1 or 10.2 or any other claims for direct financial loss that are not excluded by any of categories in condition 10.4. All notices given by you to us must be given to Easycrane Ltd at Unit 23, The IO Centre, Armstrong House, Royal Arsenal, London, SE18 6RS. or by email. We may give notice to you at either the e-mail or postal address you provide to us when placing an order. Notice will be deemed received and properly served immediately when posted on our website, 24 hours after an e-mail is sent, or three days after the date of posting of any letter. In proving the service of any notice, it will be sufficient to prove, in the case of a letter, that such letter was properly addressed, stamped and placed in the post and, in the case of an e-mail, that such e-mail was sent to the specified e-mail address of the addressee. 13.1 The contract between you and us is binding on you and us and on any person we might transfer our rights to. 14.2.1 Strikes or lock outs or other industrial action which affect third parties (for example as Royal Mail or other courier or delivery services). Contracts for the purchase of Products through our site and any dispute or claim arising out of or in connection with them or their subject matter or formation (including non-contractual disputes or claims) will be governed by English law. Any dispute or claim arising out of or in connection with such Contracts or their formation (including non-contractual disputes or claims) shall be subject to the non-exclusive jurisdiction of the courts of England and Wales. This does not affect your statutory right as a consumer to bring claims in your local jurisdiction.